This is Carrer de Boltres, a very short and narrow street in Barcelona, near Plaça de la Mercé. An elderly couple walks towards the church by the square. 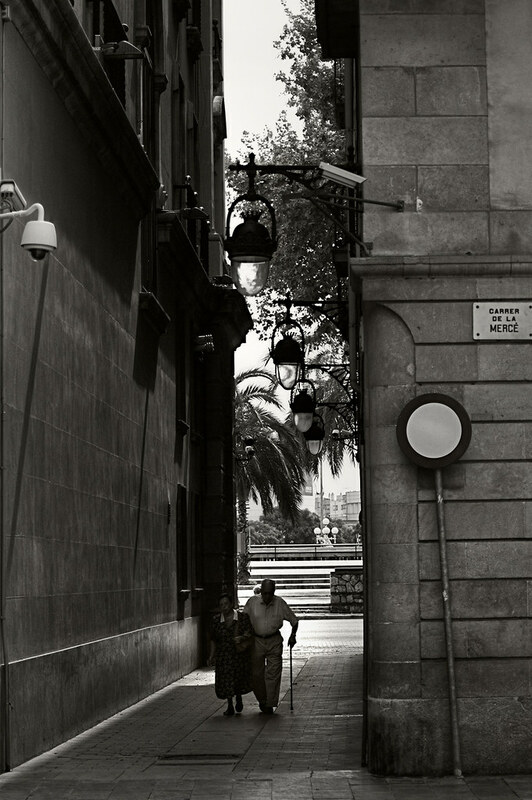 In the background, Passeig de Colom (Columbus' Walk). I happened to mention the place before, so here is the old post with a map of La Mercé church and square. You don't have to apologize ;) Just keep posting wonderful images like this one! Very nice exposure and composition! - Gracias Mario. Estoy de acuerdo le falta foco y no está del todo como yo quisiera. Espero que no sea mi vista LOL. I love the stories you and your camera tell ... I was left wondering about the story of the old couple, and I loved the dancers hands too. Fantastic B+W shot! Has a classic timeless feel. .....if there is someone by your side...life is a little bit easier, life is good. Thank you Carlos for all the wonderful stories, all the beautiful photos.....you often send me a light.